Truly, our movies are just fantasies. So whenever we go for a Hindi movie, we need to watch it, keeping our logical thinking aside and try to enjoy it with a willing suspension of disbelief. I appreciate Rohit Dhawan for making no bones about his intentions of churning out an absolutely entertaining movie providing least credence to reality. ‘Dishoom’ is a film studded with some macho and handsome men a lot show of their body and brawn, a svelte heroine who has very little to do but to show her curves, a lot of adrenaline pumping scenes in the form of car chase, bike chase, helicopter chase and fights, some opulent visuals of middle east and a very thin story line to connect them all with a touch of Indian’s most favoured game cricket and patriotism. Before the last day of the final match between India and Pakistan, the ace player Viraj Sharma (Saqib Saleem) was abducted mysteriously. 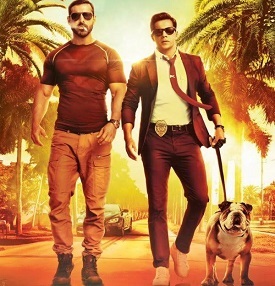 The Indian government sends a special officer Kabir Shergill (John Abraham) to find the missing player and to set things right. He is aided by a chattering, innocent but smart cop Junaid Ansari (Varun Dhawan) in Abu Dhabi. One can easily predict the scenes but what makes it interesting are witty dialogues, quick repartees, the unexpected cameos of Akshay Kumar, Nargis Fakhri, Akshaye Khanna and finally Parineeti Chopra. An out and out a male dominated movie with two well built handsome guys John and Varun, the movie should be a treat to younger generation. Not much to praise; but at the same time not much to chide; just an absolute entertainer without harm.